2019 Top Panasonic Video Converter: Convert Panasonic HD Video to MP4, MOV, AVI, etc. As an outdoor-minded buff, Panasonic camcorder may rated as the best tool to capture the open-air wonderful time or family travelling moments. No matter you are using Panasonic HC-X920K, HC-W850K or Panasonic SDR-H80, SDR-S7S, the recorded Panasonic videos are stored in AVCHD (.mts) or MPEG-2 file format, which is unfortunately incompatible with most media players and iPhone, iPad, Android devices. Therefore, in case you intend to play the recorded MTS videos on Mac/Windows with popular media player, upload them to the website for sharing or edit them with iMovie, you must indulge in the wildest fantasy unless you have a reliable Panasonic video converter in 2019. With this kind of software, it can aid you to convert AVCHD camcorder videos to MP4, MTS to MOV, AVI, FLV and more mainstream video formats so that you can play back them on any device you prefer. Being nail-biting about how to choose a fabulous video transcoder for Panasonic in 2019? 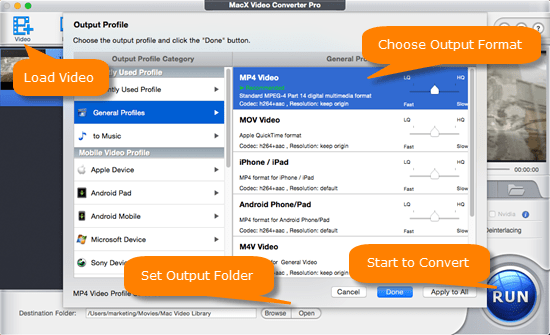 Needless to worry, here highly recommends you MacX Video Converter Pro to assist you to easily convert any Panasonic recorded video to MP4, MOV, AVI, FLV, WMV and more on Mac (Mojave) so as to play back on iPhone, iPad, Samsung Galaxy S9/Note 9, HTC One M10, Sony Xperia ZX, Surface Pro 4, Xbox One, etc, to edit in iMovie, or to upload them to YouTube, Facebook and more alike. MacX Video Converter Pro will enable to convert Panasonic 4k/HD AVCHD MOD video to MP4 MOV AVI FLV, etc. with much smaller file size and 1:1 lossless quality. Apart from converting Panasonic video to almost all the video formats, the best video converter for Mac is also a top-ranking yet feature-rich Mac tool to grant you to transfer among HD video and SD video like MKV to MP4, MTS to AVI, WMV to MOV, AVI to MP4, VOB to MP4 to name a few without any hitch. Moreover, you are also empowered to transform any video to iPhone, iPad, Samsung, HTC, Windows devices directly just in a click with the preset profiles offered to you. Certainly, honored as the best Panasonic video processing software, it's out of doubt to let you convert Panasonic video without any time waste and video quality loss, for it's equipped with advanced hyper-threading tech, multi-core CPU and High Quality Engine. Thus, you can get your desired videos just in a wink with original high quality provided. Step 1: Load Panasonic Video Files. Free download this video converter and launch it on Mac computer, click "Add File" button and locate the Panasonic video files which you want to convert to MP4, MOV, AVI or other format. Or grab the Windows version if you'd like convert Panasonic camcorder videos on Windows PCs. convert videos to iPhone, iPad, Samsung, HTC, Huawei, Surface Pro, Xbox One specific devices with 350+ preset profiles serving for you. Specify output folder on your computer to save the output files. Click the "Browse" button to select a folder where you want to place your converted MP4 files. Step 4: Start Panasonic MOD AVCHD to MP4 Video Conversion. After finish the above steps, click the "RUN" button to start to convert AVCHD video to MP4, MOV etc., you could view the conversion progress and are able to cancel the converting process at anytime. Tips: Aside from being capable to convert Panasonic video to numerous formats, this top Panasonic video converter for 2019 also a powerful program to download and convert online video to a truckload of formats regardless of HD videos (AVCHD, TS, MTS, MKV) or SD videos (MOV, MP4, AVI) from YouTube, Dailymotion, Facebook, Vimeo, Vevo, Myspace, Metacafe, Instagram, etc. 300+ video music sharing sites. Plus, it's also thoughtful enough to provide you with on-screen recording feature to record any on-screen activities like game walkthrough or non-downloadable videos for offline enjoyment. Ever wondered how to convert MOD video to MP4 on Mac easily? This tutorial introduces Mac MOD to MP4 converter to get videos off camcorder and convert to MP4 on Mac for playback on iPhone, iPad, iPod, etc. The following step by step tutorial is going to show you how to cost-free convert camcorder videos to MOV format on Mac for playback on QuickTime player.